It's getting harder to harder to pigeonhole crossovers into categories of small, medium and large these days, as they come in an increasingly wide array of shapes and sizes. Case in point: the Subaru Outback, Chevy Equinox and Toyota RAV4 are three of the most popular crossover models on the market, but each is of a particular type. The Outback is the most non-SUV-looking of the bunch; instead looking - and driving - much more like a traditional station wagon. The Equinox is dimensionally the largest, but is still smaller than a traditional midsize SUV. And the RAV4 has an SUV shape, but falls into the compact crossover category. Yet for anyone looking for a crossover with serious off-road, bad-weather capability, only the wagon-like Subaru Outback features standard symmetrical all-wheel drive, for which the automaker has become legendary, as well as a whopping 8.7 inches of ground clearance. While the Equinox and the RAV4 are available with all-wheel drive, in each case it's an expensive option. Let's take a look at other ways these vehicles compare. Power and Performance. All three vehicles have two engines options: a standard 2.5-liter four cylinder and a more powerful V6. The Outback features the boxer engine, with a horizontally-opposed piston alignment which gives the engine a lower center of gravity and contributes to the Outback's excellent traction and handling. The Outback's 3.6 liter flat-6 produces a robust 256 horsepower and 247 pound-feet of torque. Even with standard all-wheel drive, the Subaru Outback equals or tops the Equinox and RAV4 in terms of fuel economy, with an EPA-rated 25 mpg city/32 mpg highway for the boxer-4 and 20 mpg city and 27 mpg highway for the flat-6. The Outback also easily tops the Equinox and RAV4 with 2,700 pounds of towing capacity. Size and Versatility. The Outback has 35.5 cubic feet of cargo volume, compared to 31.5 cubic feet for the Equinox and 38.4 cubic feet for the RAV4. Meanwhile, the Outback offers the most front legroom at 42.9 inches, and falls in the middle in terms of rear legroom, with 38.1 inches. The Outback is also the longest of the three vehicles, making it better suited for longer cargo pieces likes lumber and skis. Safety. The Subaru Outback is the only vehicle of the three to have an across-the-board five-star safety rating from the National Highway Transportation Safety Association. 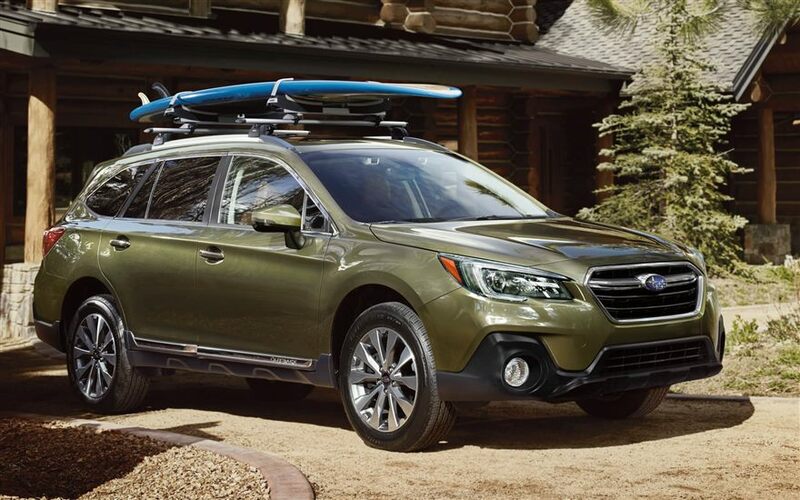 The Outback can also be outfitted with Subaru's acclaimed EyeSight® Driver Assist Technology. EyeSight uses two small cameras mounted on either side of the rearview mirror to monitor traffic movement, optimize cruise control and warn if you sway outside your road lane. The Pre-Collision Braking feature can even apply full braking force in emergency situations, helping to avoid or reduce frontal impacts.